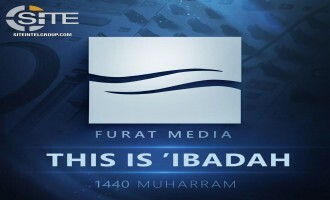 The Islamic State (IS) affiliated Furat Media released an English nasheed (chant) promoting jihad as a form of worship. 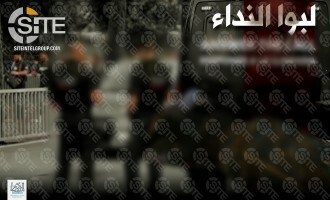 Depicting U.S. President Donald Trump assassinated, an Islamic State (IS)-linked group echoed the threat of Abu Bakr al-Baghdadi of more attacks and violent conflict to come. 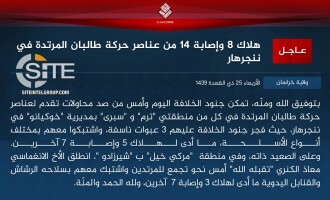 The Islamic State (IS) claimed credit for the bombing in General Santos city in which seven Filipino civilians, including a six-year-old girl, were wounded. 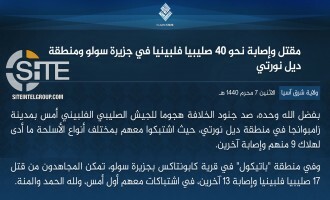 The Islamic State's (IS) East Asia Province claimed inflicting 40 casualties among Philippine forces in separate attacks in Mindanao. 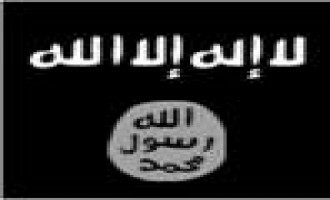 A pro-Islamic State (IS) group referred to Adolph Hitler and World War II in challenging the United States to defeat the IS. 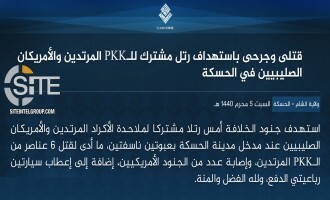 The Islamic State (IS) claimed bombing a joint patrol of American troops and Syrian Democratic Forces (SDF), or what it calls "PKK," in Syria's Hasakah governorate. 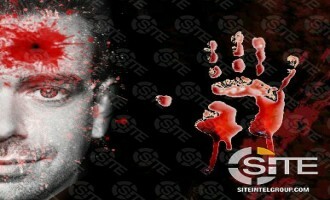 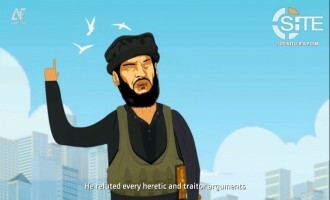 An Islamic State (IS)-linked group released a cartoon for a biography of former IS spokesman Abu Muhammad al-'Adnani. 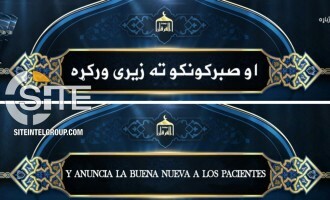 Supporters of the Islamic State (IS) disseminated Spanish and Pashto translations of group leader Abu Bakr al-Baghdadi’s most recent speech, "Give Glad Tidings to the Patient. 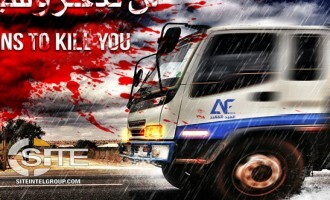 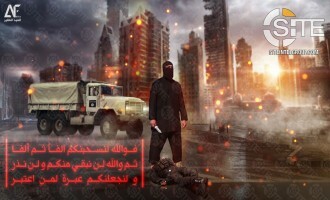 On their respective channels, al-Qaeda (AQ) and Islamic State (IS) supporters celebrated the 17th anniversary of the 9/11 attacks with posters remembering the event and threats of similar operations to come. 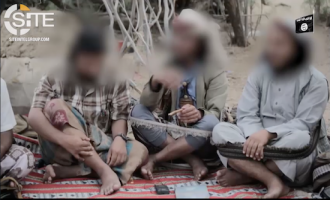 Aden-Abyan Province, a division of the Islamic State (IS) in Yemen, released a video documenting its major suicide attacks and bombings in 2016-2018 on Yemeni security forces and the Ministry of Finance building in Aden. 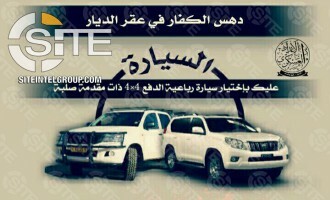 Al-Bayda' Province, a division of the Islamic State (IS) in Yemen, released a video showing its celebration of Eid al-Adha in Hadramawt. 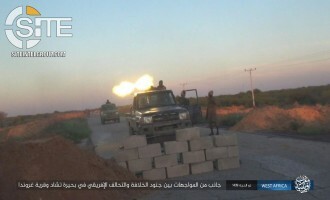 The Nigeria-based West Africa Province of the Islamic State (IS) issued a photo report on ongoing clashes with African Multi-National Joint Task Force (MJTF) soldiers in the village of Garunda. 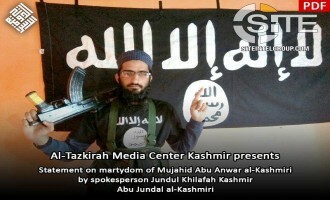 Al-Tazkirah Media, a mouthpiece for "Islamic State Jammu and Kashmir" (ISJK), said that the militant killed by unidentified gunmen in Srinagar on September 8, 2018, was the ISJK leader, and tempered the charge of responsibility against Hizb-ul-Mujahideen. 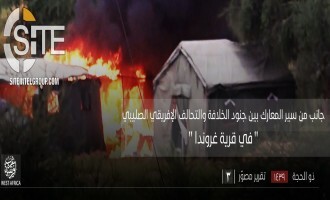 The Nigeria-based West Africa Province of the Islamic State (IS) released a video on its August 30, 2018, raid on a military post in the town of Zari in Borno State. 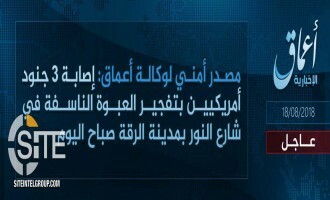 The Islamic State's (IS) West Africa Province claimed an attack on Nigerian military posts in the town of Gudumbari in Nigeria's Borno State. 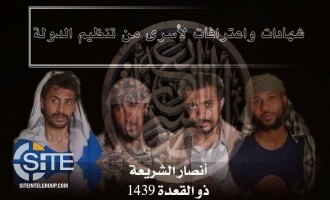 A prominent Islamic State (IS) supporting media group spun the recent video from al-Qaeda in the Arabian Peninsula (AQAP) on espionage to reflect its askew priority in entering into physical conflict with the IS. 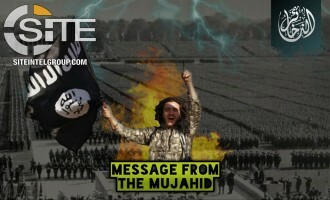 Pro-IS Kashmiri Group Echoes IS' Calls in "Reminder for the Muslims of India"
A pro-Islamic State (IS) Kashmiri group released a video echoing incitement from the IS as a "reminder for the Muslims of India". 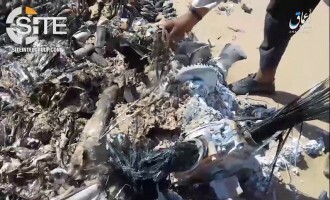 The Islamic State's (IS) 'Amaq News Agency released a video showing what it described as the wreckage of an "international coalition" helicopter in the Iraqi city of Mosul. 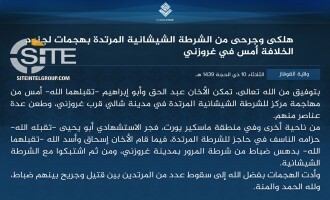 The Islamic State's (IS) Khorasan Province issued a formal communique for the suicide bombing and VBIED blast at a sports club in the Afghan capital, Kabul. 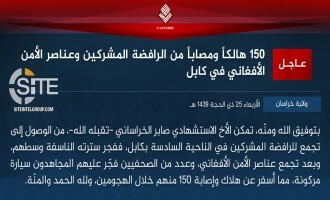 The Islamic State's (IS) 'Amaq News Agency reported 150 casualties among Shi'ite civilians, news correspondents, and security forces in a suicide bombing and car bomb explosion at a sports club in the Afghan capital, Kabul. 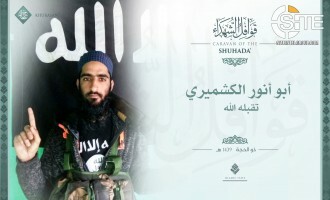 Kashmir-focused Islamic State (IS) supporters promoted Jammu and Kashmir as an alternative jihadi battlefield for those Muslims who wish to travel to Afghanistan or Afghanistan to fight but are unable. 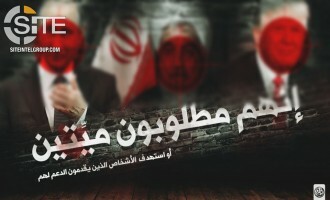 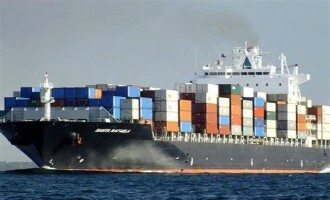 An Islamic State (IS)-linked group identified the leaders of America, Iran, and Russia and their respective people as targets. 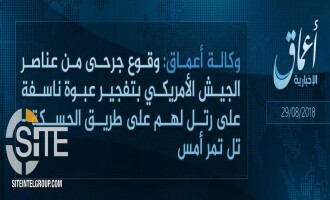 The Islamic State's (IS) Khorasan Province claimed an RPG attack on a dining facility for U.S. soldiers in Bagram district in Parwan, Afghanistan. 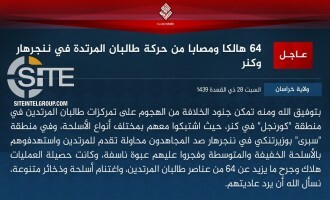 The Islamic State's West Africa Province claimed killing several Nigerian soldiers in an attack on their post in Zari, a town in Nigeria's northeast Borno state. 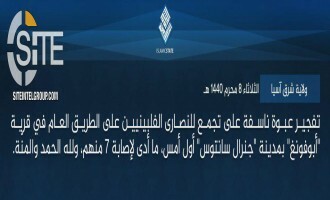 The Nigeria-based West Africa Province of the Islamic State (IS) claimed a mortar strike on Nigerian troops in the Arege area. 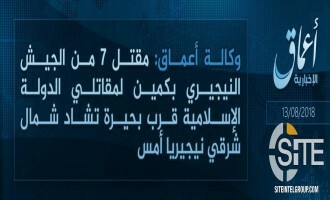 The Islamic State's (IS) 'Amaq News Agency reported that American soldiers were wounded in a bomb blast in Hasakah governorate of Syria. 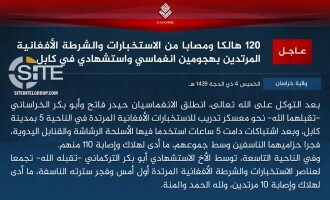 The Islamic State (IS) claimed killing 28 Iraqi soldiers and elements from the Popular Mobilization Units (PMU) and wounding 22 others in a suicide bombing in Anbar, in western Iraq. 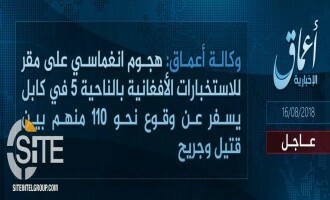 The Islamic State's (IS) East Asia Province claimed bombing Filipino soldiers in the capital of Sultan Kudarat on Mindanao island. 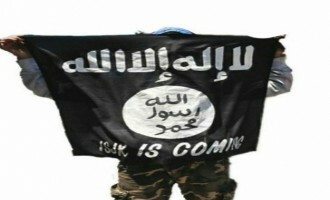 Pro-IS Kashmiri Group Links Kashmir Jihad to "Worldwide Campaign," Calls it "Integral Part of the War on Kufr"
The pro-Islamic State (IS) Jundul Khilafah Kashmir, a self-professed part of the IS' Khorasan Province, linked the Kashmir Jihad to the "worldwide campaign" and called its battlefield an "integral part of the war on kufr [disbelief]". 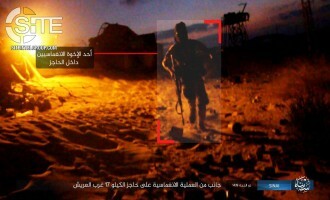 The Islamic State (IS) claimed repulsing an Egyptian military offensive and executing a commando attack in two separate incidents in North Sinai. 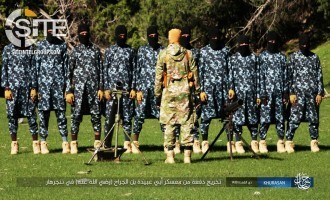 The Afghan Taliban again boasted of rendering the Islamic State's (IS) Khorasan Province an "exemplary defeat" in northern Afghanistan and charged the U.S. with not only backing the IS there but in Iraq, as well. 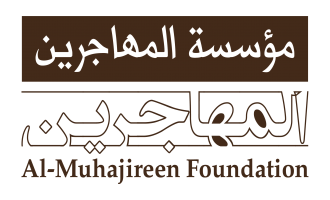 After threatening Telegram founder Pavel Durov over the suspension of accounts and channels, a pro-Islamic State (IS) group warned Twitter CEO Jack Dorsey for the same. 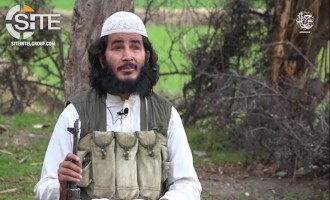 The Islamic State's (IS) Khorasan Province claimed a suicide bombing on Afghan security elements and local officials in Jalalabad, the capital of Nangarhar in eastern Afghanistan. 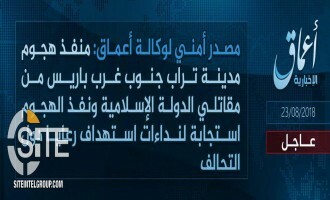 The Islamic State's (IS) Tripoli Province claimed credit for the attack on a Libyan security checkpoint in Wadi Kaam, east of the capital. 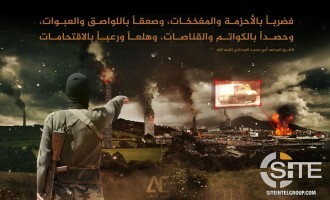 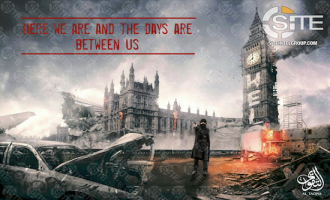 Using an open-source wallpaper image displaying a devastated city on fire, an Islamic State (IS)-linked group promoted and incited for attacks. 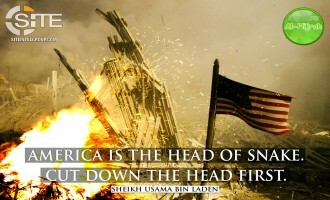 The Afghan Taliban again accused American forces of "rescuing" Islamic State (IS) fighters from its clearing operations, and charged U.S. General John Nicholson with deliberately lying to the American people about the success of President Donald Trump's strategy in Afghanistan. 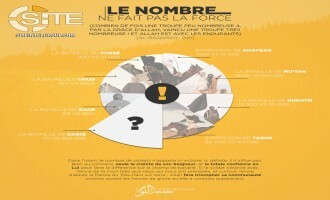 The Islamic State (IS) released the fourth episode in a video series providing statistical breakdowns of IS operations, covering in this installment the week of August 16 – August 22, 2018. 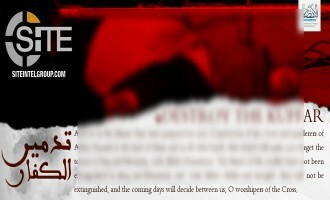 A pro-Islamic State (IS) group depicted U.S. President Donald Trump beheaded along with the word "soon". 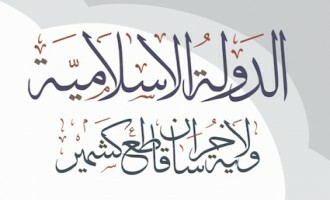 Islamic State (IS) leader Abu Bakr al-Baghdadi spoke in his first audio speech in 11 months. 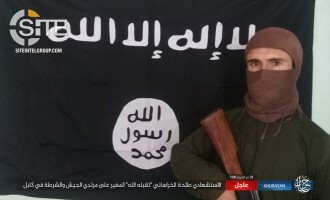 After previously claiming credit for the mortar strike on the Afghan Presidential Palace in Kabul during the Eid al-Adha speech delivered by President Ashraf Ghani, the Islamic State's (IS) Khorasan Province took responsibility for a two-man suicide raid in the capital. 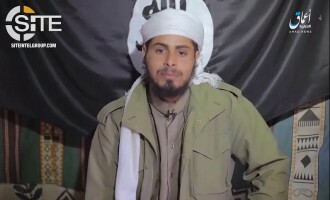 A pro-Islamic State (IS) group incited Muslims online and offline to support the IS, either through intensifying their promotion of propaganda on social media, or executing attacks with explosives, guns, knives, poisons, and vehicles. 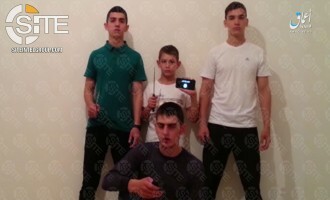 The Islamic State's (IS) 'Amaq News Agency released a video it said it received from the perpetrators of the suicide bombing and knife and vehicular attacks in Chechnya, revealed them to be children. 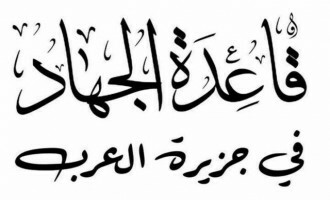 The Islamic State's (IS) Sinai Province claimed a suicide bombing on Egyptian soldiers as they allegedly bulldozed houses in al-Arish. 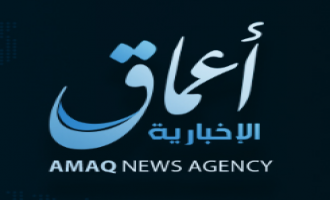 The Islamic State's (IS) 'Amaq News Agency reported that the group is responsible for the mortar strike targeting the Afghan presidential palace in Kabul. 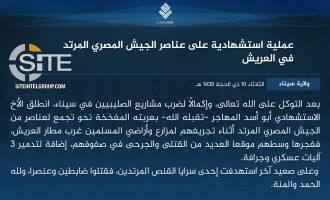 The Islamic State's (IS) Caucasus Province gave a formal communique for the coordinated attacks on Chechen police in Grozny, Mesker-Yurt, and Shali involving a vehicular strike, stabbings, and a suicide bombing. 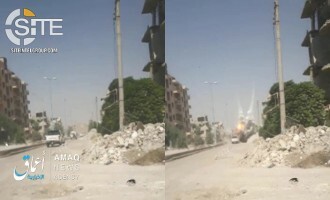 The Islamic State's (IS) 'Amaq News Agency published photos of a bomb blast on a vehicle allegedly carrying U.S. soldiers in Raqqah, Syria. 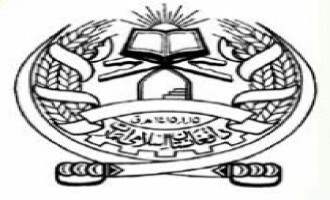 The Afghan Taliban released a video documenting its purging Darzab district in Jowzjan, a province in northern Afghanistan, from Islamic State (IS) fighters. 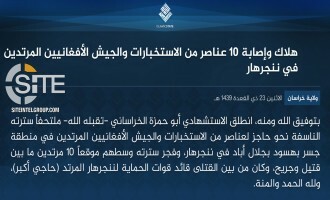 The Islamic State's (IS) 'Amaq News Agency reported that the group is responsible for separate attacks on Chechen police in Grozny and Shali. 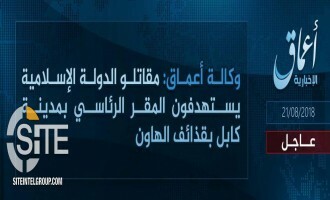 The Islamic State's (IS) 'Amaq News Agency reported that three American soldiers were wounded in a bomb blast in Syria's Raqqah governorate. 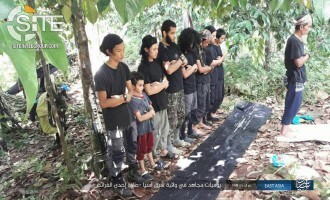 The Islamic State's (IS) "East Asia Province" published photos from the daily life of its fighters, showing them in a jungle and with a child in their ranks. 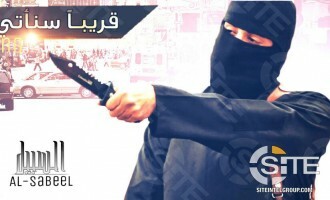 The Islamic State (IS) released the third episode in a video series providing statistical breakdowns of IS operations, covering in this installment the week of August 9 – August 15, 2018. 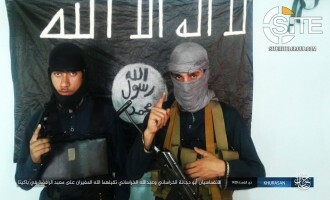 The Islamic State's (IS) Khorasan Province claimed killing and wounding a total of 120 Afghan intelligence elements and policemen in a two-man suicide raid and a suicide bombing, two days apart, in the Afghan capital, Kabul. 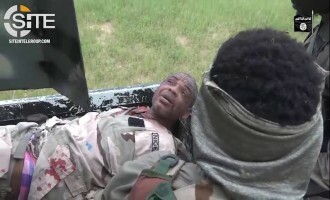 The Nigeria-based West Africa Province of the Islamic State (IS) published a photo report on clashes by its fighters with African Multi-national Joint task Force (MJTF) soldiers in Garunda village and the Lake Chad area, including an image of a POW.